The brain is the master controller of the body telling every muscle, tissue and gland what to do every moment of every day. 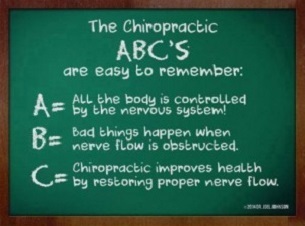 Just as the sun is controlled by the natural laws of the universe, chiropractic is based on the natural laws of the body. The sun rises and sets in a natural rhythm, and the body functions according to a physiological rhythm of its own. The brain is the master controller of the body telling every muscle, tissue and gland what to do every moment of every day. The brain communicates through the spinal cord, which includes nerves branching out like roots of a tree. Every muscle, tissue and gland is plugged into this integrated system, which we call the central nervous system. The life force or physiological communication – travels through this system to allow the body to function at its optimum level. The spinal column, which protects this integrated system, must be in proper biomechanical alignment to allow proper nerve flow to all parts of the body. A doctor of chiropractic specializes in finding and correcting spinal misalignments, which can cause pressure on the nerves, interfering with proper nerve flow. Thus, spinal misalignments can prevent the body from functioning at its optimum level.